In the climate change discussion, non-CO2 greenhouse gases (NCGGs) received official political recognition for the first time in 1997, when agreement was reached on the Kyoto Protocol. As a result methane, nitrous oxide, HFCs, PFCs and SF6 now provide attractive options for detailing the national targets for the reduction of greenhouse gas emissions meant to control climate change. This book is the second volume in this area and addresses three main topics. Firstly, it documents progress with respect to our knowledge of the sources and sinks of NCGGs. Information on this subject is essential in order to reduce the uncertainties in national emissions inventories which serve as the reference values for commitments of countries in the framework of the Kyoto Protocol. 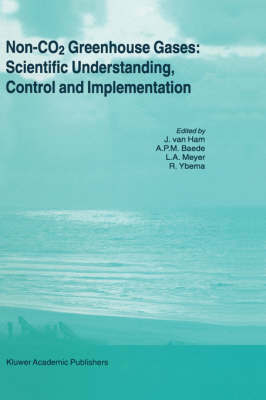 Secondly, this volume deals with the control options for the NCGGs and contains a wealth of information in this area. Emerging technologies here provide business opportunities, in particular in connection with the flexible mechanisms for mitigation projects in developing countries which have been agreed in Kyoto. Thirdly, the book treats the policy implementation of mitigation options for greenhouse gas emissions. Tools for control policies, both on the national and international level, and for different sectors of industry are discussed. National integrated approaches, including the ones from the United States Environmental Protection Agency and the Netherlands Ministry of Environment which both sponsored the conference, provide guidance for defining the most effective greenhouse gases mitigation plans in different situations. This volume is being published in support of the IPCC Process and will serve as a reference for IPCC's Third Assessment Report.